The Bhagavata Purana, also known as the Srimad Bhagavatam, is said to be the most popular of all religious texts in Hinduism. There are many translations available, but I seem to have cultivated a passion for the Motilal Banarsidass version, which comes in a set of five volumes. The following is excerpted from Part IV, the book that is Skandha X and contains the endearing and enlightening stories of Krishna’s life. When read with an open heart, these tales seem to lift you into another realm. To me this passage reveals the best of devotional Bhakti Yoga and the eternal wisdom of Samkhya. Love and devotion to the God-within you will draw you into the most wonderful subtle states of sublime consciousness where all the divine sweet mysteries of the universe are tenderly revealed. Here Krishna’s father tells his sons that he has realized Krishna’s true nature. In the Bhagavata Purana, we are sometimes told that Krishna covers his family with the veils of his Yoga Maya so they can have a more normal and thus enjoyable life with him. If they saw him always in his true form, they would be overwhelmed, as Arjuna was on the battlefield when Krishna revealed himself as Vishnu. Keep in mind that Krishna represents the incarnation of complete Supreme ONENESS that dwells within the Heart of each and every one of us. 3. Oh Krishna! Krishna! O great Yogin! O eternal Sankarsana [another name for Balarama]! I now realize that both of you [Krishna and his brother Balarama] are the Supreme Persons ruling over Prakriti and Purusha, the direct causes of the universe. 4. You are the place (Substratum), the agent and the instrument of the universe. You are its source and its object or purpose; whenever or whatever form it assumes is yourself. As and when this universe evolves, all the causes thereof including time and manner are the Almighty Lord yourself who control both the Prakriti (to be enjoyed) and Purusha (the enjoyer) and transcend them both. 5. O Supra-sensuous Lord! Having created this universe of diversified nature out of yourself, you enter it as its soul, the Indwelling Controller, and you, the eternal (inborn) Lord, become the active force (Prana) and the cognitive force (Jiva), and maintain it. 6. The powers with which Prana and Sutra are endowed and other forces which go to create the universe, are really the potencies of the Supreme Self, for these powers depend (for their existence) on you and there is a great dissimilarity between the nature of Prana and the Supreme Soul, (the former is physical or material while the latter is spiritual). The activity of Prana and others is only apparent (the real motive force is you, just as the velocity of an arrow is not in the arrow itself but in the physical force of the man who discharged it). 7. The lovely light of the moon, the heat and glare of the fire, the brilliant splendor of the sun, the twinkling of stars and streaks of lightning, the stability of mountains, the fragrance which characterizes the earth --- all these special characteristics are as a matter of fact yourself only. 8. The qualities of water, [such as] satisfying the thirst, the life-giving effect, are yourself, O God. The waters themselves and their essential characteristics, viz. liquidity and taste are yourself. The energy of senses, the mental power (firm will power), bodily strength, the activity of the body, the activities and the force of the wind are your qualities (though they are attributed to the wind element). 9. You are the space that is delimited by cardinal points; you are the quarters themselves and the ether with its characteristic the Subtle sound (sphota) which is the para form of speech. You are the sound Om, the Pashyanti form of speech. You are the Madhyama form of speech and the articulate speech (Vaikhari) which separates letter sounds and words which denote different objects. 10. You are the real sense organ, the power revealing its special objects; You are also the presiding deities of the sense and their potency. You are the cognitive and retentive faculty of the Intellect. You are the coordinating power of different experiences inherent in Jiva. 12. Just as the material substance (e.g. gold) is the constant factor all through its various modifications (e.g. various ornaments like bangles, armlets, etc. ), you are the constant factor abiding in all these perishable objects and are not [like them] subject to modification or decay. 13. The attributes of Prakriti, namely Sattva, Rajas, and Tamas and their products (such as Mahat and other principles) have been superimposed on you, the veritable Brahman, by your Yoga Maya (but you are untouched by them). 14. These created things, therefore, do not really exist, when they are not seen as projected on you (at the time of Pralaya [the periodic Dissolution of the world]) by Yoga Maya; they are nonexistent, (i.e. their very existence depends on you as the substratum on which they are superimposed). You abide in them (when you create and sustain the universe). Otherwise you remain unconnected with these modifications and abide in your absolute (blissful) state. 15. Those who are ignorant of the subtle course of yours who are the soul of all, and are present in this universe or Samsara, which is a constant flow of GUNAS, (wrongly identify themselves with their bodies through their ignorance and thereby) get enmeshed by their Karmas, and continue to whirl in the Samsara, as a consequence of those Karmas. 20. … Who can comprehend the wonderful Maya (Potency) of yours, O Omnipresent Lord? Krishna’s father is named Vasudeva. Sanskrit has specific ‘diacritic’ markings – meaning a sign written above or below a letter to indicate a difference in pronunciation from the same letter when unmarked - that allow us to distinguish the sounds of Sanskrit letters with our own alphabet. vAsudeva is also a name for Krishna, the capital ‘A’ representing an ‘a’ with a long mark over it. vAsudeva means that he is the son of Vasudeva – and more importantly it means ‘The Indweller’ and that which permeates All. 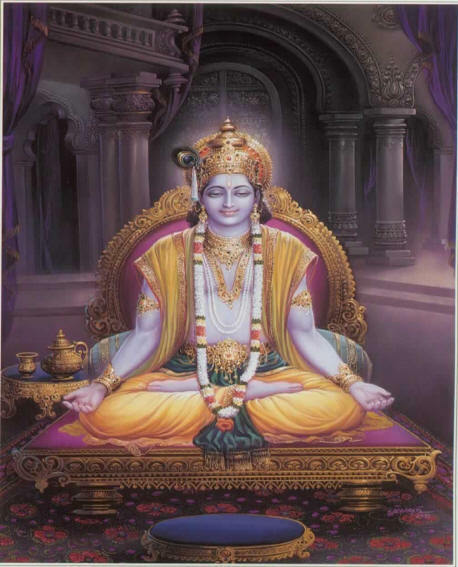 The name of the artist who created the amazing picture of Krishna in Meditation is unknown to me. I hope that he or she will not mind me sharing this wonderful and inspiring image. Thank you!